The Larchmont Times of 1901 and 1902 are editions of a weekly newspaper published by George S. Forbes. The paper was produced in New Rochelle from offices at 225 Huguenot Avenue. It became the Larchmonter Times in 1908 and was published until 1922. 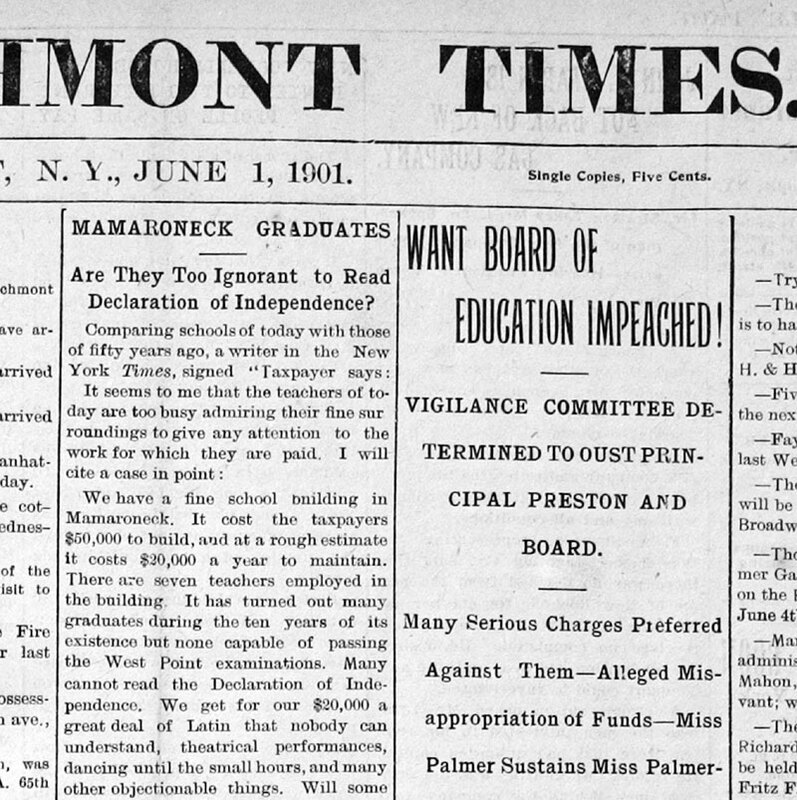 It was then succeeded by the Larchmont Times, which ran until 1955. 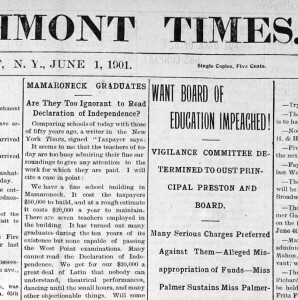 The Historical Society obtained an original set of the 1901-1902 Larchmont Times in 2008, digitized it, and then posted it to the Photo Archives. We also scanned and cropped separately a set of advertisements by local merchants and professionals. Readers Tip: you can click on an image to reach a larger version with print that is easier to read. On June 1st, a group of residents called for the impeachment of the School Board. One resident, on the front page, explained that the schools were much better 50 years ago. On July 6th, residents were warned of a new risk brought on by technology: burglars would call a home before a break-in to make sure the residents were away. On July 27th, readers were treated to the details of the Palmer’s divorce. They were a wealthy couple living in a large mansion in Mamaroneck. Were the “marks” on her body the result of “fits” as Mr. Palmer explained, or had he “ill-treated” her? On August 10th readers are told of the auction of Morris Kane’s safe. Mr. Kane was a Mamaroneck lawyer who had disappeared owing thousands of dollars. At the auction was a mysterious blond woman who had filed a breach of promise suit, but who was concerned about the love letters apparently stashed away in the safe. On September 21st, the paper covered the assassination of President McKinley. On November 2, Frank Hardy was nominated for Town Supervisor and the Republicans express confidence of victory in the upcoming election. On January 11, 1902, the headline is “New Rochelle in Mourning” and the paper describes a commuter train wreck in the tunnels of New York City. The train was a New Rochelle express, and 15 New Rochelle residents were killed and 50 injured. For several weeks there is extensive coverage of the wreck and the people involved. On February 1st, there is the entire transcript of the proceedings of a Board of Education hearing to fire Samuel J. Preston, the principal of the school in Mamaroneck, for whipping several young students. Was this cruel and unusual punishment, or well-deserved discipline? In the March 1st issue, the Board announced its decision. On February 22nd, the paper featured the proposal to develop a large cemetery in the unincorporated area of the Town of Mamaroneck that is now the Duck Pond. On March 8th, a citizens group was organized to vigorously protest against the development. On March 1st, the paper reviewed the recent indictments of the former Mayor and several Aldermen of New Rochelle. On October 4th, the paper presented the entire tax roll – the owners of all lots in Larchmont and Mamaroneck. These major stories are accompanied by advertisements, newsy tidbits about the lives of local residents, stories of parties and celebrations, and summaries of the deliberations of the governing boards.